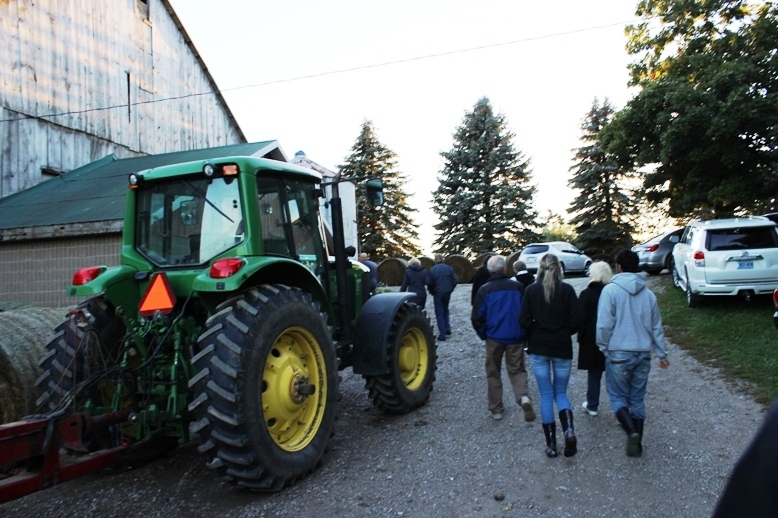 On this last Saturday of summer, it was an easy evening drive to the farm. All the way out Erb Street, through St. Agatha, right turn on Sandhill, next left onto Carmel-Koch. You’re immediately under the gaze of dozens of gentle beef cows in a grassy pasture. 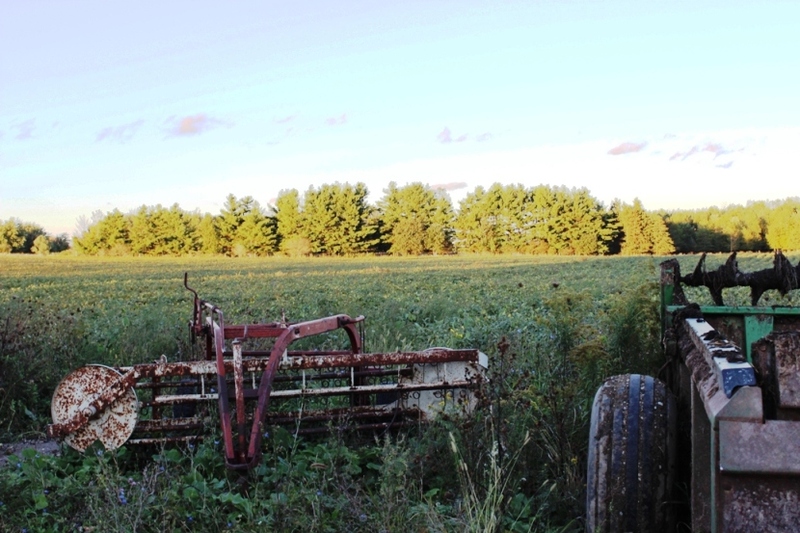 Vibrant Farms is a working farm, with all the lane way accoutrements one would expect; scrap metal, huge stumps of wood, and all sorts of machinery. 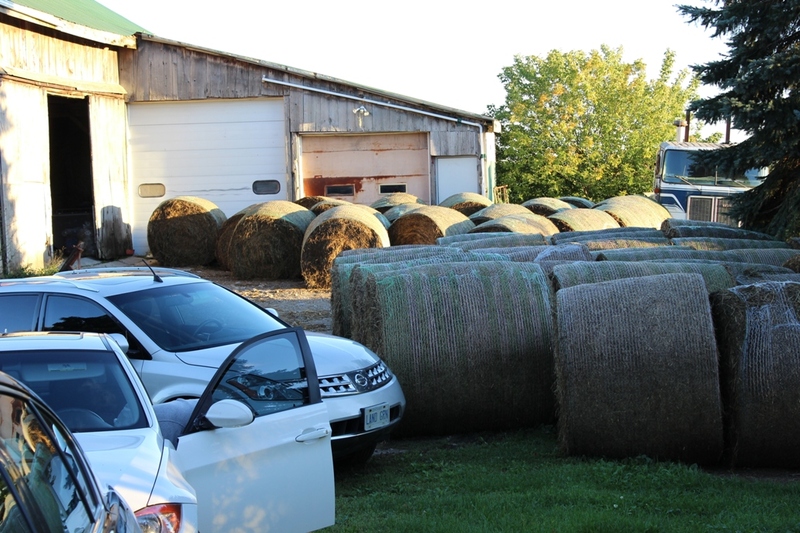 The dogs are oblivious to the cars parking amidst giant hay bales. Rubber boots and wind breakers are de rigueur. An evening with The Farmer’s Daughter has begun. 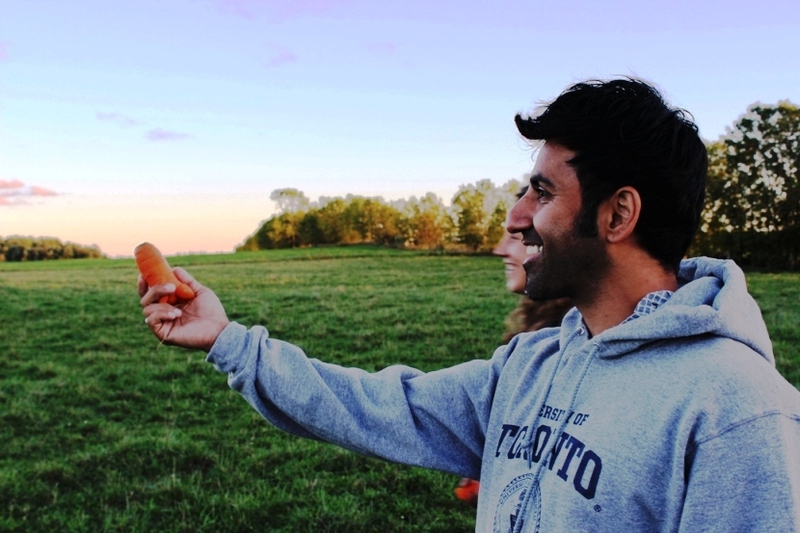 16 city slickers arrive on an organic farm for a new dining experience. 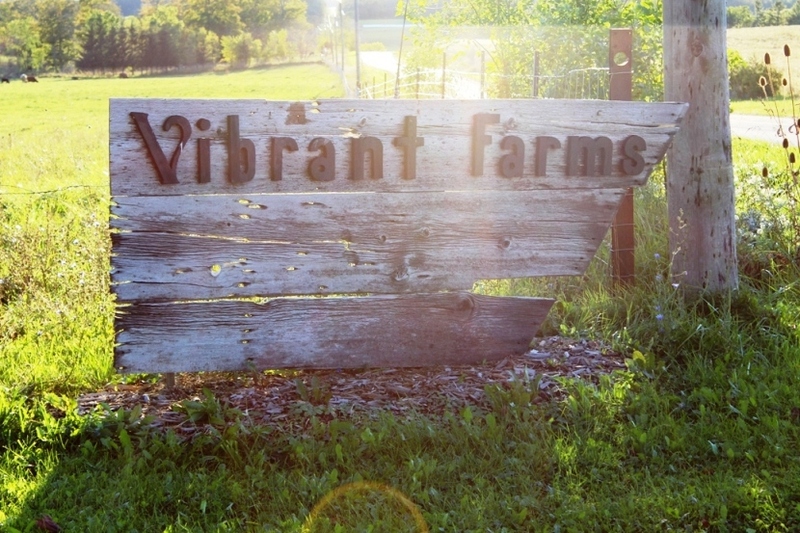 Melissa Baer is the ‘vibrant’ in Vibrant Farms, and is best known as The Farmer’s Daughter. 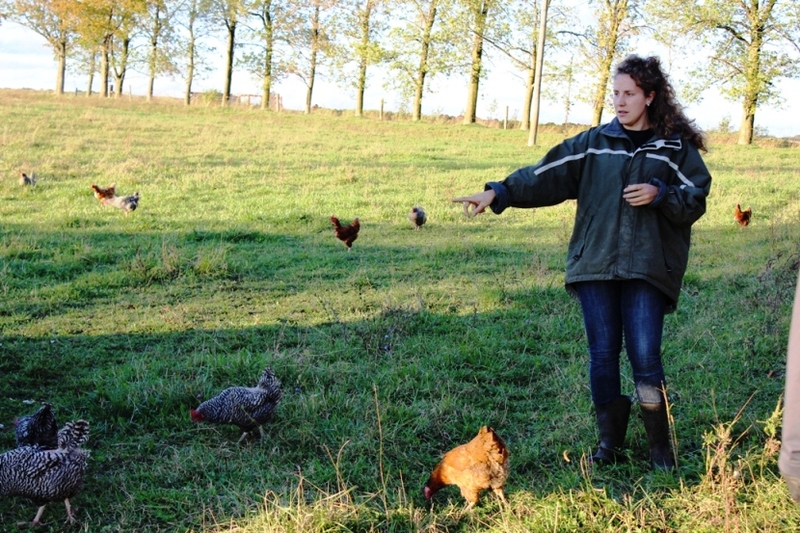 An organic food producer, she takes her role as educator seriously. 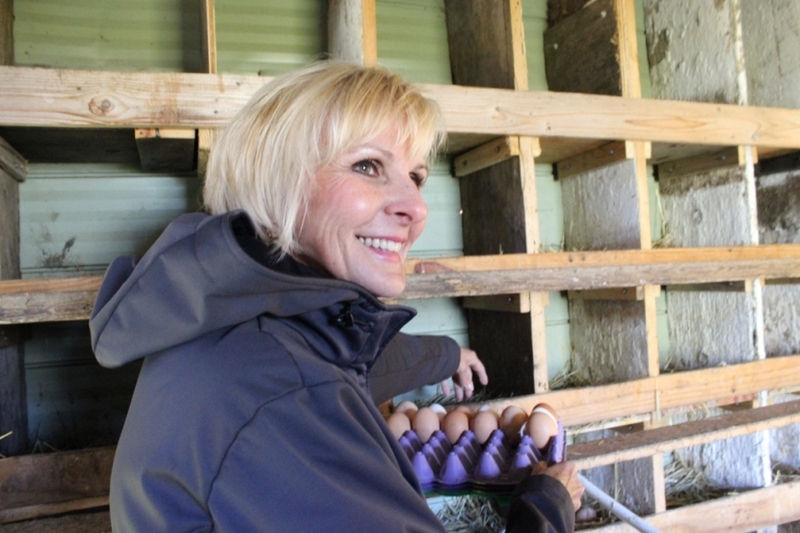 Hers is what she calls an ‘interactive’ outing–an opportunity to introduce her guests to local food and producers. To renewable resources. Organic field production. It’s short walk to the rooster and laying hens strutting outside their retrofitted coop. 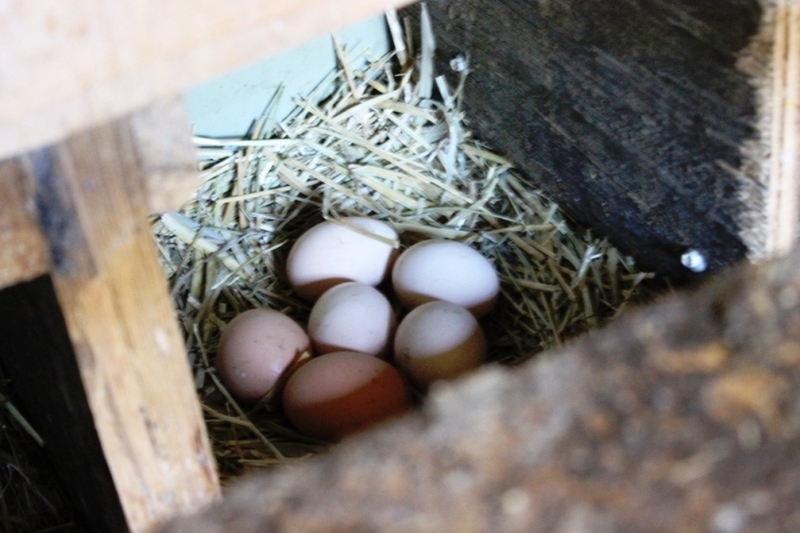 Fluffy white and black hens and dark heritage birds hop up alongside and brush up against you as you climb up into the coop, nudging in and cooing right into your ear while you’re collecting their eggs. They seem oblivious to tourists and I suppose they are. 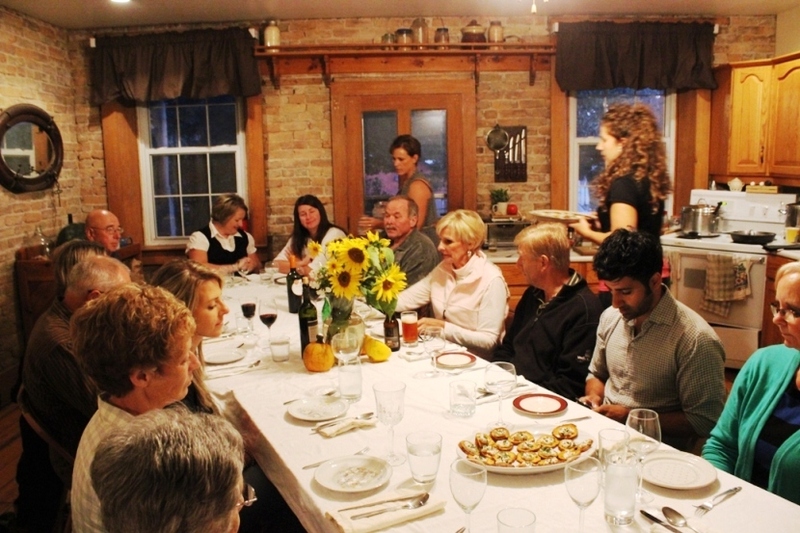 Melissa hosts four or five dinner events each month through spring and summer. Huddled against the wind, this group is reluctant to walk down to the beef cattle, so we changed direction. 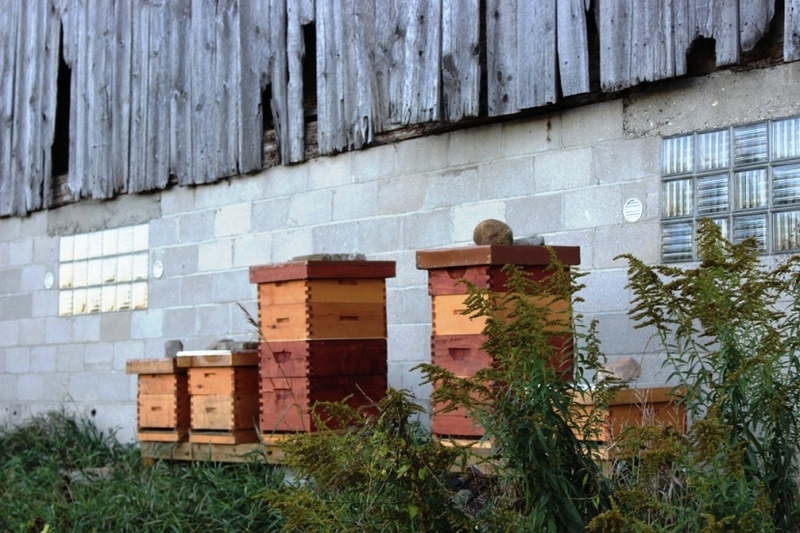 Bee hives. 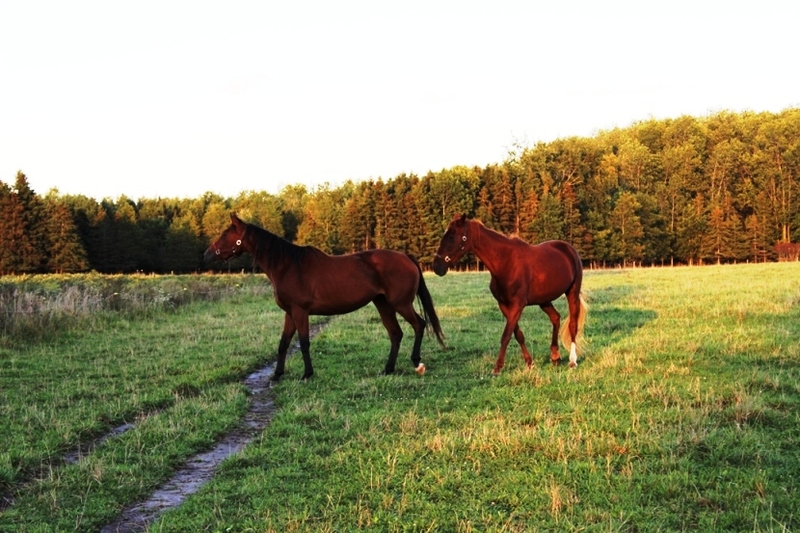 Outrageously beautiful retired race horses. Fields of organic soybeans lit by the setting sun. One old gentle dog limping along loyally while his younger counterpart did the hard dog’s work. Aushton, our own horse whisperer. 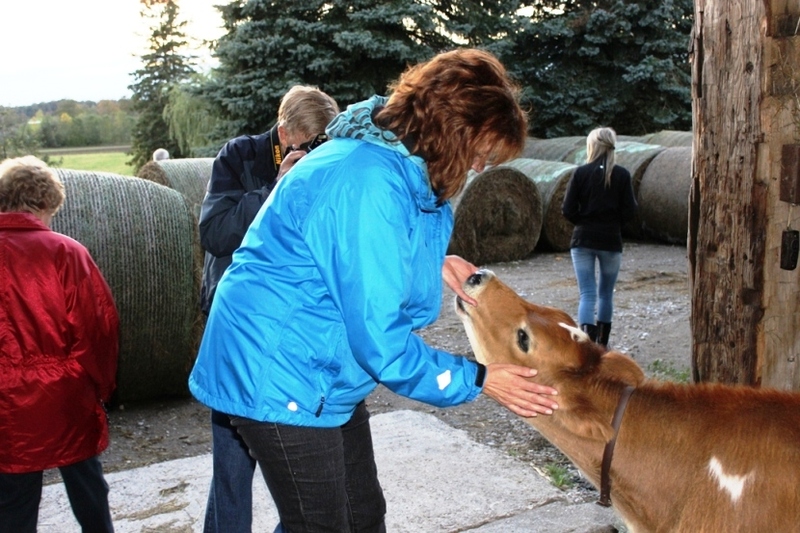 My highlight of the farm tour was meeting the dairy cows,Ruby and Ice Cream. So lovely. And friendly. Ruby gently and completely licked my entire jacket while I rubbed her head and cheeks. Some crazy kittens came tearing through, causing a ruckus, hoping for some spilled milk. They must see us tourists coming a mile away. 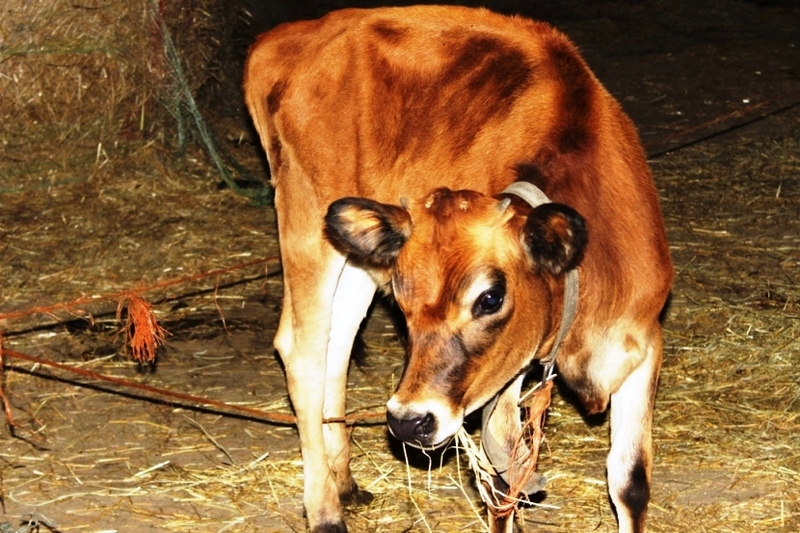 Milking a cow isn’t easy. I was surprised at the firm warm udder and very short teats. Not what I expected. A warm and friendly mama milk giver. Wildhair Gardener with baby sucking, so stupidly cute. Fresh farm air makes for a feisty hungry group. Delicious smells wafted over us as we washed up in the big old sink and sat down in the large country kitchen. Now’s your chance to have a meet up with the other dinner guests. From 24 to 74, we’re a cornucopia of people and personalities, chatting up more similarities than differences. There was never a lapse in conversation, that’s for sure! First course; sweet potato medallions, herbed goat cheese with freshly chopped garden basil. Ambrosia… and I don’t even like sweet potatoes. According to Melissa, I am not the first reluctant lover of sweet potatoes. WHO KNEW. Then the salad with organic baby greens, unsweetened cranberries (wow), almonds, and organic unpasteurized apple cider vinaigrette. Not one of us has ever found unsweetened cranberries and Melissa shared her secret. They can be purchased at Organic Oasis (I have been and it is charming) as well as visiting any outlet for Pfennings, an excellent in town local choice. Next up, egg drop soup with organic chicken broth. The main course? 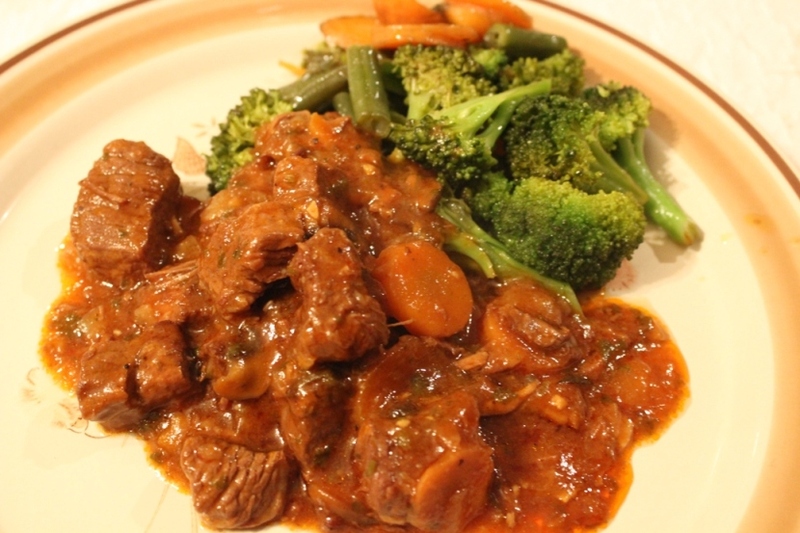 Delectable melt in your mouth grass fed beef bourguignon alongside organic vegetables. Did we want Seconds? Did we hear that right…Oh yeah! Dessert was chocolate cake (made without sugar, flour, or any grains). Mapleton`s organic vanilla ice cream. 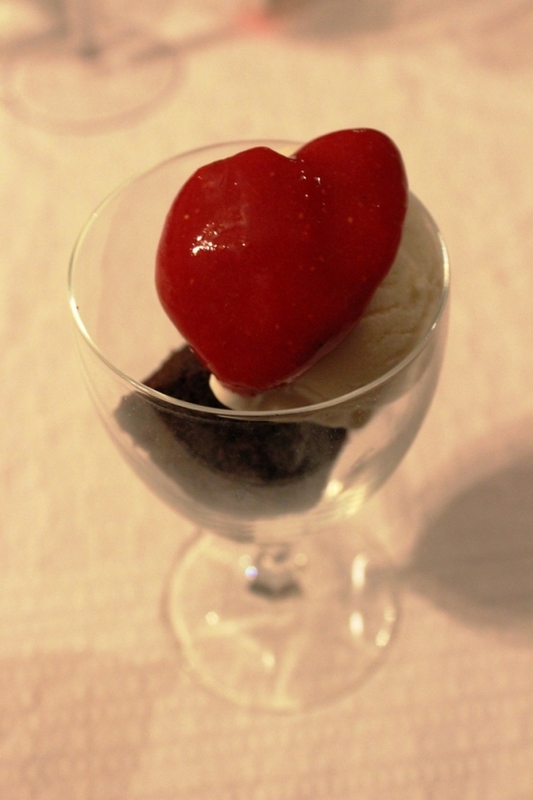 Strawberries, unsweetened, just pureed. How the cake was made was the question of the evening. I won’t tell you the answer; you’ll have to find out for yourself. No coffee. 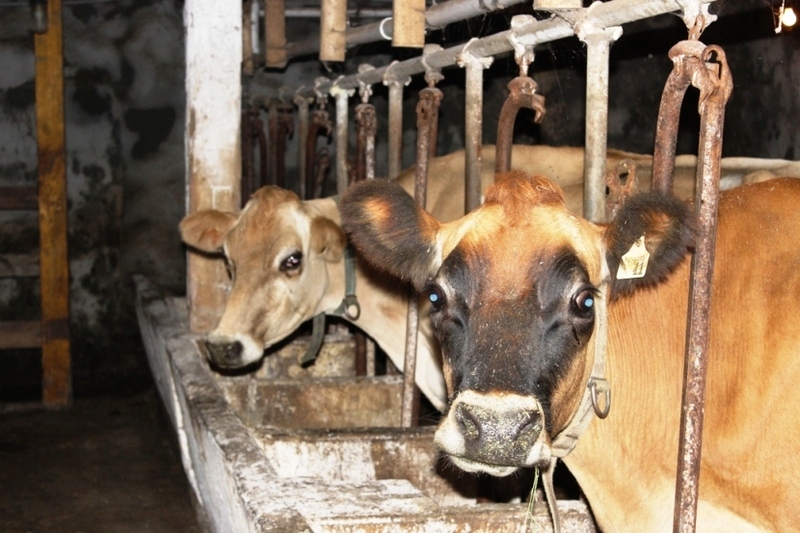 No dairy. Hot tea brewed with chocolate mint from the garden along with local honey was the hot drink offering, if you weren’t too full. We were satiated by the entire experience and new friends were made by all. Melissa is working on her Fall dinner schedule. 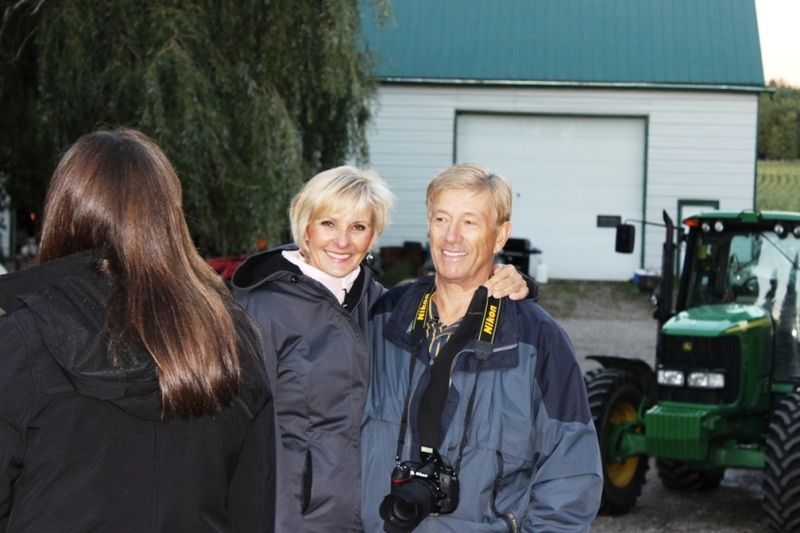 Hubby and I are joining his Sister and brother-in-law in October, plus planning a private family gathering at the farm. It’s simply too rare an experience not to share. 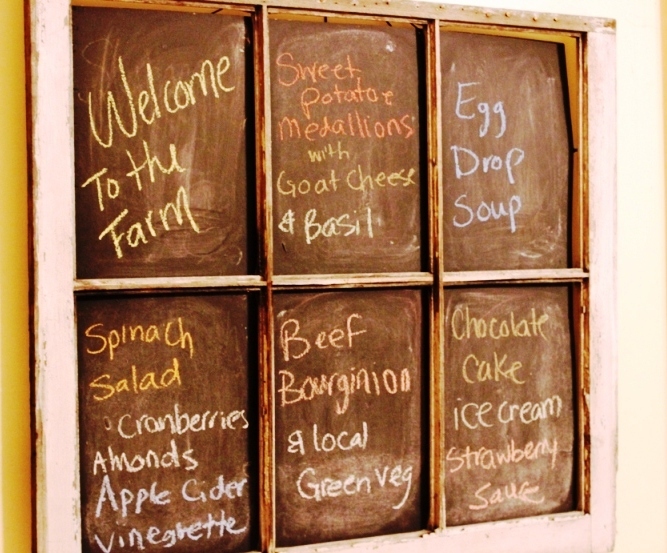 You can find Melissa at The Organic Farmer’s Daughter. She’s also offering a whole new adventure, bringing the farm to you, if you can’t come to the farm. Nanette and Erik. Good times at the farm. 1st Annual Pond Tour–we couldn’t do it without our Sponsors or our Judges. Trinity Retirement Studios WINS the Pondless Waterfall Feature.